Photo by: INCO / Fame Pictures A portrait of the late Heath Ledger won the people's choice award at Australia's Archibald Prize Exhibition on Thursday. More than 32,000 people voted in the competition – considered one of Australia's most prominent art prizes. 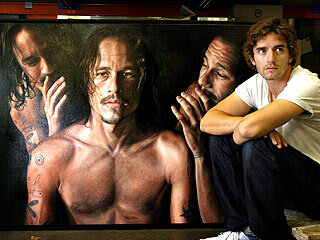 The painting, called "Heath," was created by Ledger's friend, Vincent Fantauzzo, shortly before the actor's death. According to a spokesperson for the Art Gallery of NSW (where the prize was awarded), the Ledger family and the artist will donate the prize-winning piece – which features three images of Ledger – to the gallery. Fantauzzo received a $2,500 and $1,000 gift certificate with his award. The portrait was painted at Ledger's Perth family home in December. What a beautiful portrait. You can see a lot of love went into that. It is gorgeous work, looks like a photograph. had nothing to do with him dying, of course. I was just going to say ... timing is everything. Agreed. Looked like a tortured soul. Agreed. He looks like hell. And I hate that everyone is cashing on his death. I love that portrait, stunning. My thoughts exactly. Had he not died this painting would mean nothing. i loved heath ledger but i don't like that painting. i just don't like the style of it. though i like the idea of the two heaths whispering in his ear. Last edited by sputnik; May 12th, 2008 at 04:42 PM. Yeah. Would this have won if it were Roy Scheider? edited to say: I love Heath and was sad about his death. I was just thinkin' is all. Heath Ledger - what do you think? Gay Australian pub wins right to ban straights.